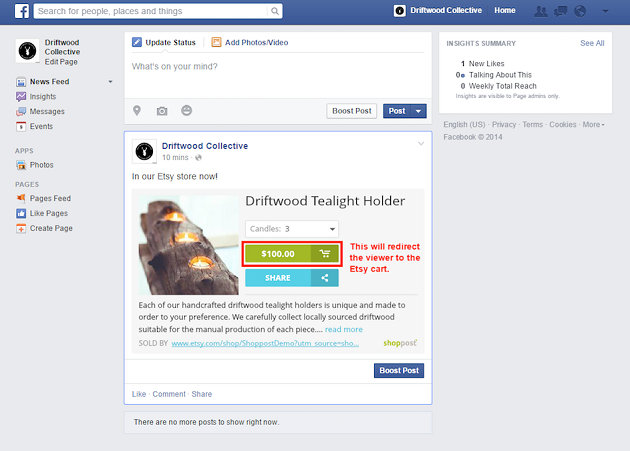 It is now easier for Etsy merchants to market their products on social networks like Facebook and Twitter. This is because e-commerce company Zantler has made its social commerce platform Shoppost available to Etsy merchants. With Shoppost, merchants can merchandise and sell their products in-stream on social networks like Facebook, Twitter, Pinterest and Tumblr through a post that mimics an e-commerce storefront. Posts that are published on social networks through the Shoppost platform display product details, including images, availability, sizing, colors and pricing, which are taken directly from an Etsy retailer’s merchant page. Once a customer clicks the buy button on the post, they are directed to the merchant’s Etsy branded shopping cart. Moreover, the Shoppost Web app provides merchants with an analytics tool that offers data about customers’ engagement and the products that convert best. In addition to Shoppost’s availability on Etsy, the company has introduced a sharing to Tumblr button. This button is similar to the platform’s existing buttons for social networks like Facebook, Twitter and Pinterest, as it enables merchants to post products to Tumblr with a single click, as well as enables consumers to share the posts from one social media platform, like Facebook, to Tumblr. Previously, merchants could share Shopposts on Tumblr only with embed codes. “Because of the huge volume of fashion and apparel on Tumblr, and the large percentage of apparel and accessory merchants using Shoppost, it was a natural fit for us to amplify our Tumblr support with the share button,” said Zantler President James Lively. “With Tumblr being recognized as the fastest-growing social platform concurrently with our Tumblr share button launch, this enhancement will provide our merchant base a valuable tool to expand their social reach and increase conversions." Shoppost for Etsy comes after the company launched availability of its platform for Amazon Webstore last month. It is also important to note that Shoppost is available for merchants and consumers to use free of charge.